Hardcover: Oxford University Press, 2018. Contract law has long been one of the basic building blocks of private law. Today, contract law has added significance, because the modern emphasis on market solutions has led to the increased contractualization of other areas of law. Furthermore, many of the elements of contract law, such as interpretation and mistake, spill over into law generally. 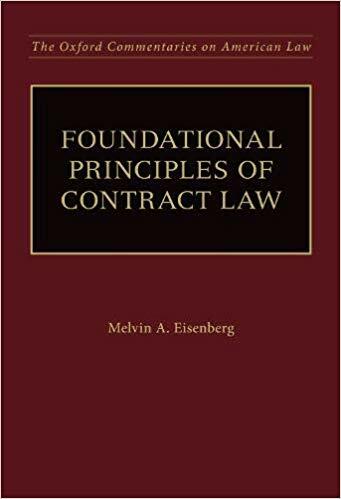 Over the course of a long academic career, Melvin Eisenberg has been engaged in a project of reconceiving contract law, and the result is his magisterial Foundational Principles of Contract Law, which (1) Discusses the principles and rules of contract law, while placing emphasis on what the principles and rules of contract law should be, based on policy, morality, and experience. (2) Covers many areas of contract law, including the enforceability of promises, remedies for breach of contract, problems of assent, form contracts, the effect of mistake and changed circumstances, interpretation, and problems of performance. (3) Explores important theories in contract law, including the theory of efficient breach, the theory of overreliance, the normative theory of contracts, formalism, and theories of contract interpretation.